Today, we’re taking a look at Dragonite-GX (Dragon Majesty 37/70). Being a GX means the usual, improved stats, possibly better effects, a GX attack, gives out two prizes if KOed, and may be benefitted or hindered by other cards. Being a Stage 2 means it’ll be slow to get in play outside of Rare Candy. 250 HP is the highest based on printed HP scores, though that still isn’t safe enough of being OHKOed by a select few decks. Being weak to Fairy can vary its severity. And the retreat cost of three is hefty, though searchable with Heavy Ball. Dragonite-GX has no ability, so it’ll come down to three attacks. Dragon Claw costs L for 70 damage. For something that’s cheap and doing this much damage without drawbacks is very generous. Gigs Impact costs WLCC for 200 damage, with the clause saying this Pokémon cannot attack next turn. Another decent attack whose side effect can be circumvented by switching out and re-promoting it to the Active. Dragonporter-GX costs CCC and puts three dragon Pokémon from the discard pile onto your Bench. For the most part, it doesn’t care which stage it is, but for past cards, you cannot put a Break Evolution because part of the information in the card is missing. The deck would be clunky anyways if you’ve tried to put Hydreigon or Noivern inside a Dragonite deck. So how do we use it? Both Dragon Claw and Dragonporter would be the focus. Dragonporter is needed to fetch dragon Pokémon from the discard pile onto your bench. Ideally supporting Pokémon that can help Dragonite. Altaria’s Fight Song is probably the best partner with Dragonite-GX, as each one grants 20 additional damage. Considering Dragon Pokemon isn’t hitting any other Pokémon for weakness, outside of BW-era Dragons, every little damage helps. With three Altaria, Dragon Claw now does 130 damage, enough to 2HKO anything. And Choice Band hasn’t been attached yet! And since it cost only one energy, you can flush all damage with Max Potion and just use your manual attachment. That’s what I can think of when trying to use it; it’d be like picking up where Garchomp/Altaria left off but with more durability. There’s no sanctioned Prerelease for dragon Majesty mostly because those packs are inside gift boxes. Assuming you host one, then being a Stage 2 could be a pain, risk one of the evolutionary line in the prize and actually drawing into it. Dragonite GX (DRM 37) swoops into the Pokemon TCG out of the Dragon Majesty expansion set. This Stage 2 Dragon Pokemon has 250 HP and three attacks. Dragon Claw, for a single Lightning energy, does 70 damage. Giga Impact does a whopping 200 damage but prohibits Dragonite from attacking on its next turn. Dragonporter GX – for three Colorless energy – allows you to put any three Dragon Pokemon from your discard pile directly onto your bench. I have seen players use the Dragon Claw strategy with Choice Band, smacking away for 100 damage and then using Max Potion to remove all damage its opponent inflicts during the next turn (in the 1,004 attacks I tracked from August 28 through October 20, only 14 of them did 250 or more damage). Giga Impact does good damage but requires at least one Water energy. And Dragonporter seems like it might be a great way to put three really good evolution Pokemon on your bench without having to invest in the resources to normally evolve them (this could potentially free up a dozen card slots in Stage 2 decks if you’re counting Basics, Stage 1’s, and Rare Candy). I’ve only gone up against Dragonite GX twice, and I’ve beaten it both times. No top finishing deck at any major tournament has played even a single copy. 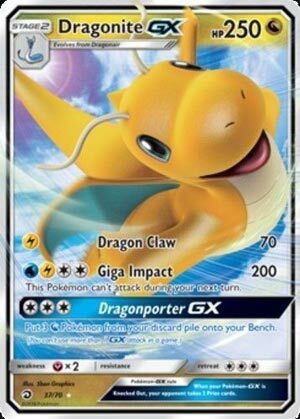 Dragonite GX joins the long list of Stage 2 GX Pokemon that just can’t compete in today’s meta.